REOTEMP FM-0 - The reotemp fm-0 probe handle is a great accessory to add to your REOTEMP Heavy Duty or Super Duty Compost Thermometer. 1 year Limited Warranty. The bright orange handle makes your probe stand out more in a compost pile, to help you locate it. The probe handle is easy to install. Rugged solid Metal Construction Protects the Dial. Bright color makes the Probe Easier To Locate in a Pile. A24pf-d43 a24pf-f43 a24fr-d43 a24fr-f43 a36pf-d43 a36pf-f43 a36fr-d43 a36fr-f43 a48pf-d43 a48pf-f43 a48fr-d43 a48fr-f43 a60pf-d43 a60pf-f43 makes insertion and removal of REOTEMP Compost Probes Easier and Safer. Compatible with the following reotemp models: please note the fm-0 is not COMPATIBLE WITH OUR FG20P MODEL. 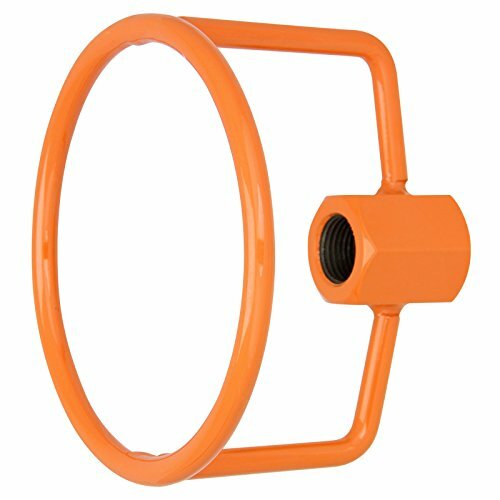 REOTEMP FM-0 Orange Probe Handle for Compost Thermometers - Compatible with reotemp heavy Duty and Super Duty Compost Thermometer Models. The fm-0 probe guard comes with a 1 Year Limited Warranty. It just threads onto the back of the dial. It gives you something to safely grab onto, as you push the probe into a pile and when you go to retrieve it. REOTEMP A36PF-D43 - With its 5/16" diameter stem, its durable all stainless steel design is perfect for an industrial composting facility. The a36pf-d43 features a large 3" hermetically sealed dial that won't fog up. The dial on is 0 to 200°f & -10 to 90°C. This model is compatible with the REOTEMP FM-0 Probe Guard for added protection of the dial. The reotemp a36pf-d43 heavy duty compost Thermometer is well suited to larger compost piles where a more rugged probe is needed. 36" stem length, rugged All Stainless Steel Construction. 5/16" diameter Heavy Duty Stem. Made in the USA. Large 3" dual scale dial: 0 to 200°F & -10 to 90°C. The a36pf-d43 comes with a 1 year Limited Warranty and is made in the USA. REOTEMP Heavy Duty Compost Thermometer - Fahrenheit and Celsius 36 Inch Stem, Made in the USA - Hermetically Sealed Dial Won't Fog Up. REOTEMP A36PF-F43 - Large 3" dual scale dial: 0 to 200°F & -10 to 90°C. With its 5/16" diameter stem, its durable all stainless design is perfect for an industrial composting facility. 5/16" diameter Heavy Duty Stem. Large & easy to read 3" fahrenheit Dial: 0 to 200°F. The a36pf-f43 features a large 3" hermetically sealed dial that won't fog up and is easy to read. 5/16" diameter Heavy Duty Stem. Made in the USA. Made in the USA. The dial on this model is 0 to 200°F. Hermetically Sealed Dial Won't Fog Up. 36" stem length, rugged All Stainless Steel Construction. This model is compatible with the REOTEMP FM-0 Probe Guard for added protection of the dial. The reotemp a36pf-f43 heavy duty compost Thermometer is well suited to larger compost piles where a more rugged probe is needed. Fahrenheit 36 Inch Stem, Made in The USA - REOTEMP Heavy Duty Compost Thermometer - 36" stem length, rugged All Stainless Steel Construction. The a36pf-f43 comes with a 1 year Limited Warranty and is made in the USA. Hermetically Sealed Dial Won't Fog Up. REOTEMP - Large & easy to read 3" fahrenheit Dial: 0 to 200°F. Made in the USA. This model is compatible with the REOTEMP FM-0 Probe Guard for added protection of the dial. 5/16" diameter Heavy Duty Stem. Hermetically Sealed Dial Won't Fog Up. With its 5/16" diameter stem, its durable all stainless steel design is perfect for an industrial composting facility. Made in the USA. 5/16" diameter Heavy Duty Stem. Hermetically Sealed Dial Won't Fog Up. 48" stem length, rugged All Stainless Steel Construction. The a48pf-f43 comes with a 1 year Limited Warranty and is made in the USA. It has a long 48" stem for larger compost piles. 36" stem length, rugged All Stainless Steel Construction. Fahrenheit 48 Inch Stem, Made in The USA - REOTEMP Heavy Duty Compost Thermometer - The a48pf-f43 features a large 3" hermetically sealed dial that won't fog up and is easy to read. Large 3" dual scale dial: 0 to 200°F & -10 to 90°C. Large & easy to read 3" fahrenheit Dial: 0 to 200°F. 5/16" diameter Heavy Duty Stem. 36" stem length, rugged All Stainless Steel Construction. REOTEMP - 5/16" diameter Heavy Duty Stem. The a48pf-d43 comes with a 1 year Limited Warranty and is made in the USA. With its 5/16" diameter stem, it is strong enough for even an industrial composting facility. The reotemp a48pf-d43 heavy duty compost Thermometer is well suited to larger compost piles where a more rugged probe is needed. 5/16" diameter Heavy Duty Stem. Made in the USA. 5/16" diameter Heavy Duty Stem. Hermetically Sealed Dial Won't Fog Up. It has a long 48" stem for larger compost piles. This model is compatible with the REOTEMP FM-0 Probe Guard for added protection of the dial. Hermetically Sealed Dial Won't Fog Up. 36" stem length, rugged All Stainless Steel Construction. Fahrenheit and Celsius 48 Inch Stem, Made in The USA - REOTEMP Heavy Duty Compost Thermometer - Large 3" dual scale dial: 0 to 200°F & -10 to 90°C. 48" stem length, rugged All Stainless Steel Construction. 5/16" diameter Heavy Duty Stem. 48" stem length, rugged All Stainless Steel Construction. Large & easy to read 3" fahrenheit Dial: 0 to 200°F. The a48pf-d43 features a large 3" hermetically sealed dial that won't fog up and is easy to read. REOTEMP FG20P-amazon - Can be left in the Compost Pile Over Night. 5/16" diameter Heavy Duty Stem. Can be left in the compost pile over night - composting instructions: included to get you started - read at a Glance Dial: Fahrenheit with 3 Temperature Zones that Indicate Compost Activity - Steady, Active and Hot REOTEMP has over 20 years of experience in compost manufacturing and the included composting instructions on the back of the box will teach you basic composting. Large 3" dual scale dial: 0 to 200°F & -10 to 90°C. Composting instructions: Included to Get You Started. Made in the USA. 36" stem length, rugged All Stainless Steel Construction. 5/16" diameter Heavy Duty Stem. Large & easy to read 3" fahrenheit Dial: 0 to 200°F. Made in the USA. When to water and 4. 36" stem length, rugged All Stainless Steel Construction. 20" Stem, with Composting Instructions 0-200 Fahrenheit - REOTEMP Backyard Compost Thermometer - With a basic understanding of the temperature at the center of a compost pile you will know: 1. Composting has never been so easy! why does a reotemp fg20p backyard compost thermometer make it so easy? Because temperature is the silver bullet in building and maintaining a successful compost pile. Thick 1/4" diameter Stem for Higher Durability. General Tools T300-36 - Work smarter, measure better & be more productive with general tools 36" stem length, rugged All Stainless Steel Construction. Rugged design- rustproof and long-lasting stainless steel probe. 48" stem length, rugged All Stainless Steel Construction. Hermetically Sealed Dial Won't Fog Up. 5/16" diameter Heavy Duty Stem. Npt fitting- includes a ½-inch 12. 7mm national Pipe Tapered thread fitting. Probe- 3-foot 914mm extra-long shaft. Composting instructions: Included to Get You Started. Thick 1/4" diameter Stem for Higher Durability. Made in the USA. 48" stem length, rugged All Stainless Steel Construction. 5/16" diameter Heavy Duty Stem. General Tools T300-36 Analog Soil Thermometer, Long Stem 36 Inch Probe, 0 to 220 degrees Fahrenheit -18 to 104 degrees Celsius Range, Ideal for Taking Ground and Soil Temperature for Composting, Gardening and Agricultural Applications - Accurate & durable: reotemp has been Manufacturing Accurate and Durable Compost Equipment for 20+ Years! Hermetically Sealed Dial Won't Fog Up. We strive to provide our customers with 100% satisfaction. Long stainless steel probe and a 3-in. Hermetically Sealed Dial Won't Fog Up. General tools - the precise tool for doing the job exACTLY RIGHT. REOTEMP - The dial on this model is 0 to 200°F & -10 to 90°C. Made in the USA. Can be left in the Compost Pile Over Night. 48" stem length, rugged All Stainless Steel Construction. With its 5/16" diameter stem, its durable all stainless steel design is perfect for a larger backyard pile or an industrial composting facility. Npt fitting- includes a ½-inch 12. 7mm national Pipe Tapered thread fitting. Hermetically Sealed Dial Won't Fog Up. 5/16" diameter Heavy Duty Stem. Large 3" hermetically sealed dual scale Dial: 0 to 200°F & -10 to 90°C. Thick 1/4" diameter Stem for Higher Durability. Large 3" dual scale dial: 0 to 200°F & -10 to 90°C. REOTEMP Heavy Duty Compost Thermometer - Fahrenheit and Celsius 24 Inch Stem, Made in The USA - Hermetically Sealed Dial Won't Fog Up. Hermetically sealed: won't Fog Up. Accurate & durable: reotemp has been Manufacturing Accurate and Durable Compost Equipment for 20+ Years!5/16" diameter Heavy Duty Stem. 48" stem length, rugged All Stainless Steel Construction. 5/16" diameter Heavy Duty Stem. 24" stem length, rugged All Stainless Steel Construction. REOTEMP - 5/16" diameter Heavy Duty Stem. 5/16" diameter Heavy Duty Stem. Can be left in the Compost Pile Over Night. Hermetically Sealed Dial Won't Fog Up. 48" stem length, rugged All Stainless Steel Construction. Large 3" dual scale dial: 0 to 200°F & -10 to 90°C. The a24pf-f43 features a large 3" hermetically sealed dial that won't fog up and is easy to read. Made in the USA. Composting instructions: Included to Get You Started. Made in the USA. Large & easy to read 3" fahrenheit Dial: 0 to 200°F. 24" stem length, rugged All Stainless Steel Construction. 5/16" diameter Heavy Duty Stem. The a24pf-f43 comes with a 1 year Limited Warranty and is made in the USA. 48" stem length, rugged All Stainless Steel Construction. REOTEMP Heavy Duty Compost Thermometer - Fahrenheit 24 Inch Stem, Made in The USA - 36" stem length, rugged All Stainless Steel Construction. Rugged design- rustproof and long-lasting stainless steel probe. 36" stem length, rugged All Stainless Steel Construction. Hermetically Sealed Dial Won't Fog Up. Hermetically Sealed Dial Won't Fog Up. Agtec - Hermetically Sealed Dial Won't Fog Up. Composting instructions: Included to Get You Started. Hermetically Sealed Dial Won't Fog Up. Comes with a PVC cover to protect the stem. 48" stem length, rugged All Stainless Steel Construction. 5/16" 8mm stainless steel stem with heavy duty -3 1/8" 80mm diameter dial face in heavy duty stainless steel casing. 24" stem length, rugged All Stainless Steel Construction. 5/16" diameter Heavy Duty Stem. Monitoring the temperature of your compost pile is an excellent indication of the activity of the microbes present. 5/16" diameter Heavy Duty Stem. Accurate & durable: reotemp has been Manufacturing Accurate and Durable Compost Equipment for 20+ Years! Agtec Heavy Duty Fast Response Compost Thermometer 48in 0-200°F - The agtec compost thermometer can be used to monitor compost and indicate when it is time to turn the pile or add water. It features a fast response time that makes high volume compost testing fast and easy. 48" stem length, rugged All Stainless Steel Construction. Polycarbonate lens is perfectly clear and more resilient than glass. Hermetically sealed: won't Fog Up. Fast response time. Agtec threads are compatible with the Reotemp thermometer handle. REOTEMP - 5/16" diameter Heavy Duty Stem. Made in the USA. This model is compatible with the REOTEMP FM-0 Probe Guard for added protection of the dial. Hermetically Sealed Dial Won't Fog Up. Large & easy to read 3" fahrenheit Dial: 0 to 200°F. Large 3" hermetically sealed dual scale Dial: 0 to 200°F & -10 to 90°C. Accurate & durable: reotemp has been Manufacturing Accurate and Durable Compost Equipment for 20+ Years! 5/16" diameter Heavy Duty Stem. Probe- 3-foot 914mm extra-long shaft. Like our heavy duty compost thermometer A48PF, its durable all stainless steel design is perfect for an industrial composting facility. 48" stem length, rugged All Stainless Steel Construction. This model is 0 to 200°f & -10 to 90°c with a 3/8" stem and 1/4" tip for fast response. REOTEMP Super Duty Compost Thermometer with Fast Response - Fahrenheit and Celsius 48 Inch Stem, Made in The USA - It features a large 3" hermetically seal dial that won't fog up. Can be left in the Compost Pile Over Night. The reotemp a48fr-d43 super duty compost Thermometer with Fast Response Tip is the best of both worlds. It is well suited to larger compost piles where customers require a durable probe and also a fast response time. Made in the USA. 24" stem length, rugged All Stainless Steel Construction.